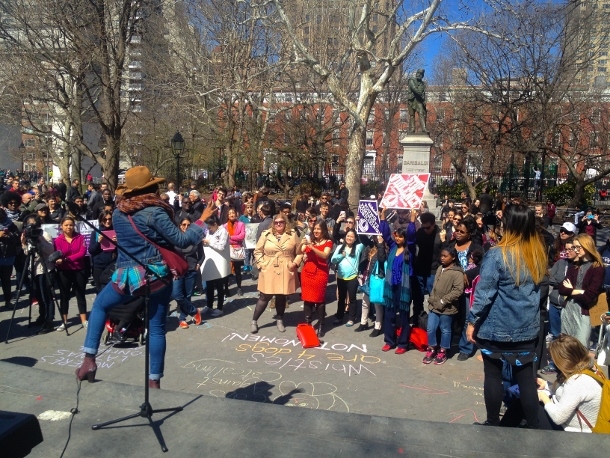 Activists from various anti-street harassment groups held a rally in New York City on Saturday featuring music, spoken word poetry, dance and giant inflatable cats. The rally was aimed at raising awareness about sexual harassment in public spaces and featured women from various backgrounds sharing their experiences and frustrations with street harassment. The event, hosted by Hollaback! and co-sponsored by a number of other groups, took place in Washington Square Park alongside a 12-foot inflatable “cat against catcalling.” After Public Advocate Letitia “Tish” James opened up the event, speakers and artists performed and told their stories of being whistled at, catcalled, and objectified in public. Due to this fact, the rally made sure to feature queer, trans and disabled women of color as speakers and performers. LaLa Zannell of the NYC Anti-Violence Project spoke about trans experiences with harassment and violence while Thereasa Macintosh of Voices of Women Organizing Project spoke about the experiences of disabled women. And in between dance routines by the Sydnie L. Mosley Dance Company and anti-street harassment song performances by Sarah Kervin, there were spoken word poems about catcalls, discussions of women in the media, and calls for people to more openly speak out against street harassment. After the speakers and performances, there were several workshops held including a dance workshop and a self-defense workshop.